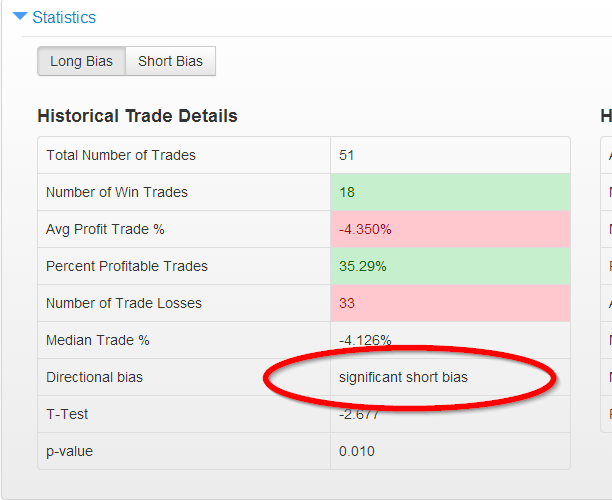 For the past couple years, being short volatility has been a popular and successful strategy for traders. So successful that brokers started regularly pitching short VIX strategies (mostly involving options) a couple years ago to funds as an easy way to generate returns (and commissions for the broker). When trades look easy to everyone it’s usually not the end, but it’s definitely the beginning of the end. As the $VIX approaches single digits we started looking for any possible reasons to take a contrarian view and be long volatility. $VXX, has become the tail that wags the dog in the world of volatility with around 30MM shares traded per day. So we let that be our liquid proxy for volatility (structural faults and all). We put $VXX through our regular screens to see if anything interesting popped up. Nothing. So we started getting into some more extreme and esoteric scenarios. Still nothing. We put it through just about every screen we could think of — literally torturing the data to tease a result — and nothing came back. Our conclusion: You could waterboard $VXX time series data and still not generate a compelling technical reason to be long. When a trade is so conclusive, crowded, and consensus in one direction, it becomes VERY interesting. Afterall, what does the market like to do to most of the people most of the time? Given how “inevitable” the $VXX march to zero has become, I would not be at all surprised to see it do the opposite. Any rally will be likely be short-lived and explosive, but there may be some extra yardage given how crowded the short side of the volatility trade is. The $VXX is a short-term speculative vehicle by design and should be avoided like the plague by anyone who considers themselves a gentleman. If you must indulge, be very prudent with position sizing because history has proved there’s no reliable way to “nail” the bottom. Disclaimer: Nothing on this site should ever be considered to be advice, research or an invitation to buy or sell any securities, please click here for a full disclaimer.